TREO restaurant, 5703 Main Street, Sylvania, (419) 882-2266, is introducing J. Trees Cellars wine to Ohio with a special wine dinner at 6 PM, Tuesday, February 8. ﻿﻿﻿ J. Trees is the newest winery in the area and its wines have won the praise of our tasting team. The winery is in Petersburg, Michigan, with a convenient tasting room in Blissfield. This is your opportunity to be among the first to sample these special wines. For just $35 a person you can enjoy a three-course meal, with each course paired with one of J. Trees Cellars finest bottles of wine. Special guest will be owner and winemaker Jon Treloar, who will be present to talk about the wines including a 2008 Dry Riesling, a 2008 Chardonnay, and Fuji Ice Cider made with pressed apples from Beach House President Katrina Iott’s more than 90 acres of apple orchards and fields of tomatoes, cabbage and corn, known as Iott Orchards. The Fuji Ice Cider is made with a process similar to icewine with the fruit being picked and pressed when it is frozen. This is a very special sweet treat. The wine is in high demand and with good reason. The wine is available for purchase after the tasting and the pricing is very reasonable. 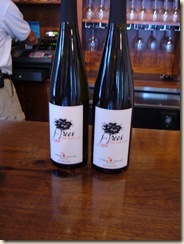 When we visited the tasting room last summer we bought two bottles of the Dry Riesling. TREO is a super restaurant with nice decor and a great menu. It has a comfortable yet upscale feel and a good location on Main Street in Sylvania. We enjoy dining there for there for special occasions or just an evening out. If you haven't eaten there before, you're in for a treat. We're planning on being there and suggest you call now to book your reservation.